A federal weather official warns "we are ... entering the peak of tornado season"
More tornadoes are possible Tuesday in Joplin and other cities in the central U.S.
On CNN tonight at 9 ET, Piers Morgan has more on the recovery effort. At 10 ET on "AC360º," Anderson Cooper reports live from Joplin and has firsthand accounts of surviving the tornado. Read more about this story from CNN affiliates KOTV, KSHB and KODE. Share your stories, photos and video with iReport. 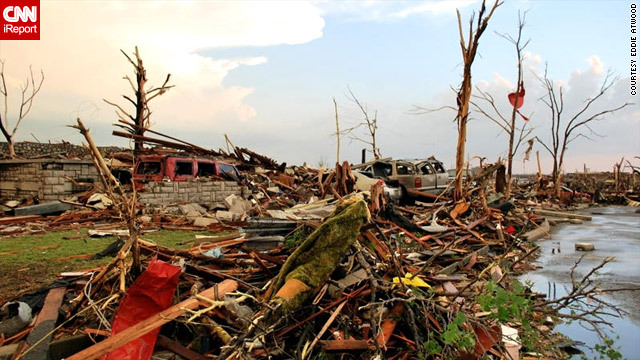 Joplin, Missouri (CNN) -- The toll from the tornado that ripped through Joplin soared to 116 on Monday, a city official said, tying it for the single deadliest twister to ever hit American soil since the National Weather Service began keeping records 61 years ago. By Monday night, they'd found 17 people alive -- a stark contrast to the fact that the number of fatalities is unmatched since a tornado struck Flint, Michigan, on June 8, 1953. "We're going to cover every foot of this town," Missouri Gov. Jay Nixon said from the National Guard Armory in Joplin. "We are ... optimistic that there are still lives to be saved. But (first responders) have seen a tremendous amount of pain already." The Sunday-evening tornado chewed through a densely populated area of the city, causing hundreds of injuries as it tore apart homes and businesses, ripped into a high school and caused severe damage to one of the two hospitals in the city. Based on preliminary estimates, the twister ranked as an EF-4 with winds between 190 and 198 mph, National Weather Service director Jack Hayes said. "Everybody's going to know people who are dead," said CNN iReporter Zach Tusinger, who said his aunt and uncle died in the tornado. "You could have probably dropped a nuclear bomb on the town and I don't think it would have done near as much damage as it did." The nightmare may not be over for Joplin or other parts of the United States, with the weather service warning about more potential disaster on Tuesday. The National Weather Service warned there was a 45% chance of another tornado outbreak -- with the peak time between 4 p.m. and midnight Tuesday -- over a wide swath, including parts of Texas, Oklahoma, Arkansas, Missouri and Nebraska. The Storm Prediction Center placed several large cities in the most high-risk area, along with other cities including Kansas City, Missouri; Dallas; Topeka and Wichita, Kansas; and Oklahoma City and Tulsa, Oklahoma. Joplin is among them. Already, parts of the city of 50,500 were unrecognizable, according to Steve Polley, a storm chaser from Kansas City, Missouri, who described the damage as "complete devastation." Aerial footage from CNN affiliate KOTV showed houses reduced to lumber and smashed cars sitting atop heaps of wood. Other areas appeared to be nearly scoured clean. Damage to the city's infrastructure was severe. Numerous phone lines and cell phone towers were down, making it hard to communicate, state officials said. Empire District Electric Co. reported on its website that 14,000 customers were still without power Monday evening. Missouri American Water Co. asked customers to conserve water and boil what they do use. More than 1,000 law enforcement officers from four states were in Joplin aiding with disaster response, including search and rescue, said Collin Stosberg, a spokesman for the Missouri State Highway Patrol. More than 250 National Guard members were on the scene -- including specialized search-and-rescue teams, military police and engineers -- with another 450 on standby, said Maj. Gen. Steven Danner. The federal government is also involved, with Nixon saying he'd talked with President Barack Obama and Homeland Security Secretary Janet Napolitano on Monday to help coordinate this effort. The second-ranking official at the Federal Emergency Management Agency, Richard Serino, noted Monday that Obama had already issued a disaster declaration -- expediting the dispersal of federal resources to the area -- while vowing that "we are going to be here for the long haul." In the short term, though, the focus is on finding survivors. But the work was slowed by a new round of severe weather -- including thunderstorms and hail two inches in diameter -- that rolled through the city Monday, as well as widespread problems with broken natural gas lines and other safety issues, authorities said. The tornado touched down at 5:41 p.m. Sunday -- 24 minutes after a warning was issued -- said Thomas Schwein, central regional director for the National Weather Service. It grew to as wide as three-quarters of a mile at one point along its estimated four-mile track, according to Missouri's State Emergency Management Agency. "It was hard to discern where you were at," resident Eddie Atwood said of going through downtown soon after the twister hit. "All you could see is devastation. It was more like walking through 'The Twilight Zone' than walking down Main Street." St. John's Regional Medical Center sustained significant damage after being hit directly, according to a statement from Lynn Britton, president of Sisters of Mercy Health System, which operates the hospital. One glass facade of the building was blown out, and authorities evacuated the medical center, said Ray Foreman, a meteorologist with CNN affiliate KODE in Joplin. Makeshift triage centers were set up in tents outside, witness Bethany Scutti said. Structural engineers were on their way to Joplin to assess the hospital building, where 1,700 people work. The hospital was treating 183 people when the storm struck, Britton said. It was unclear if any were injured in the storm. The patients were taken to hospitals as far away as Springfield, Missouri, and northwest Arkansas. Residents 70 miles away from Joplin in Dade County, Missouri, found X-rays from St. John's in their driveways, said Foreman, indicating the size and power of the storm. Gurneys were blown several blocks away. Officials evacuated long-term patients from the city's other medical center, Freeman Health System, to make room for emergency cases from the tornado, Nixon said. That hospital treated 465 patients, including 11 who died, the hospital said in a statement. A Freeman Health System hospital in nearby Neosho, Missouri, treated 39 people, the hospital said. Medical staff at Via Cristi Hospital in Pittsburg, Kansas -- about 20 minutes from Joplin -- had treated 80 patients and admitted 35 people into the hospital, spokesman Michael Hayslip said. Most of the patients came "in extremely fast in groups" Sunday night, suffering everything from minor cuts to broken bones, he said. A nursing home was believed destroyed, among other structures, the State Emergency Management Agency reported. Walmart spokesman Lorenzo Lopez said the tornado "blew through" one of its stores, killing and injuring an unspecified number of people -- none of them Walmart employees. He added that the Arkansas-based company has pledged $1 million to help with relief efforts in Joplin. The city's public school district canceled classes for the rest of the year after the tornado caused significant damage to several buildings. Joplin High School, whose seniors had just finished graduation ceremonies at a nearby university when the storm struck, was ripped apart, Principal Kerry Sachetta said. "It just looks like it's been bombed from the outside in," he said. "It's just terrible." St. Mary's Catholic Church and its elementary school also were demolished, said Recy Moore, a spokeswoman for the Springfield Diocese, which includes Joplin. The pastor, the Rev. Justin Monahan, rode out the storm in a bathtub at the rectory. "Parishioners had to dig him out, but he's OK," she said. C.J. Campbell and his foster sister survived the storm, despite the home they were in collapsing around them. Campbell called the tornado an "evil monster vortex" that began as a low roar, then got louder until it sounded like "50 semi-tractor-trailer trucks fully laden going about 70 miles per hour about 10 feet outside the front door." "The floor began to vibrate and then shake very violently and seemingly buckle, and we thought we were going to be sucked up the chimney," he said. The storm also overturned as many as a dozen tractor-trailers on Interstate 44 as it barreled through Joplin, a major trucking center. The interstate, shut down for nearly 12 hours, reopened Monday morning, according to Mike Watson with the Missouri State Highway Patrol. No motorists were severely hurt, he said. Amber Gonzales was driving through southwest Missouri when she heard tornado warnings on the radio. She took refuge at a gas station before getting back on the road and seeing the aftermath of what she narrowly missed. At a shopping center, she saw people pulling victims from rubble and rushing them to the hospital as overwhelmed emergency workers were unable to reach everyone in need. "I saw an older woman taken on the back of a truck bed, speeding down the road," Gonzales said. "I can't get the lady out of my mind. ... I don't know if she made it." Sunday's tornado was part of a line of severe weather that swept across the Midwest on Sunday, prompting tornado watches and warnings that stretched from Wisconsin to Texas. High winds and possible tornadoes struck Minneapolis and other parts of Minnesota, leaving at least one person dead and injuring nearly two dozen others, police said. Elsewhere, reports of tornadoes came in from Forest Lake, north of the Minneapolis-St. Paul area, and near Harmony, more than 120 miles to the south. In Minneapolis, witnesses reported numerous downed trees and neighborhoods without power. Minneapolis police spokeswoman Sara Dietrich said the storm left one fatality, with 22 people reported hurt. LeDale Davis, who lives on the north side of Minneapolis, told CNN, "This is the first time we can remember a tornado touched down in this area. They aren't usually in the heart of the city." Forecasters said the system that struck Minnesota was separate from another storm that struck eastern Kansas on Saturday, killing one person and damaging or destroying hundreds of homes there. Hayes said that 2011 is already at least the ninth deadliest season on record. That includes the tornado that hit Hackleburg and Phil Campbell, Alabama, and killed 78 people, while the one that struck Tuscaloosa and Birmingham killed 61. Those two events rank sixth and seventh respectively for tornado-related deaths in the National Weather Service's official records. The records date to 1950, when the weather service came to a consensus on how to track tornadoes and count casualties. 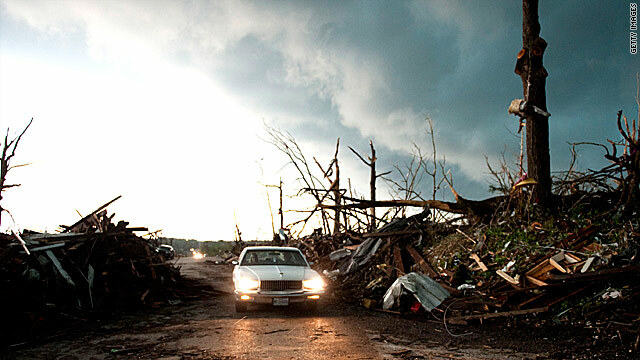 Unofficial records cite the 1925 Tri-State tornado in Missouri, Illinois and Indiana as the deadliest single twister ever, with an estimated 695 fatalities, according to the weather service. But meteorologists note that it isn't known if those fatalities came from one or more tornadoes, as compared with the single twister that has been confirmed in Joplin. While the strength and toll of this year's more than 1,000 twisters may suggest an alarming trend, weather service officials said they will need time and research to put it all into perspective. And one warned that the destruction likely isn't over. "We have to be aware that we are now just entering the peak of tornado season," said Russell Schneider, head of the Storm Prediction Center. "You can never completely breathe easy." CNN's Chuck Johnston, Joe Sutton, Greg Botelho, Marleena Baldacci, Mike Pearson, Greg Morrison, Holly Yan, Rick Martin, Jessica Jordan, Sean Morris, Divina Mims and Steve Brusk contributed to this report.